Southside Cleaning based in Glasgow offer a professional cleaning service for both domestic and commercial customers. Their cleaning services include Window Cleaning, Domestic Cleaning and Pressure Washing. The company is fully insured and are health & Safety compliant. As well as residential cleaning for private residences, their commercial window cleaning work is available for shops, hotels, pubs, restaurants, offices, industrial units, care homes, retail outlets and showrooms. Thorntonhall Window Cleaning is a family run business based in Glasgow. Customers include residential homeowners and some property managed developments. Service include domestic window cleaning, upvc fascia and soffit board cleaning, gutter cleaning using the Gutter Vac system, and also some communal area cleaning. The company uses the water fed pole system for window cleaning and is has been issued with the required local authority Licence to work in the Thorntonhall area. The company is also fully insured. Their highly trained staff can provide a comprehensive service for anyone who requires regular window cleaning or exterior upvc cleaning work to be carried out using a professional cleaning service. Clearwater Cleaning are a fully licensed and insured window cleaning company based in Scotland near Airdrie. They are registered with North Lanarkshire Council and use the latest technology in cleaning equipment which includes the use of a water-fed pole system to clean your glass, frames, sills and doors. Additional cleaning of surrounds, conservatories, gutters and fascias is available upon request on an individual quote basis and a detailed list of additional services can be found on the services page of their website. The company provides a cleaning service tailored to your requirements on a fortnightly or monthly basis and any additional work will be undertaken subject to your request. All work is 100% guaranteed. Fife Clean is based in Dunfermline and offers a friendly, professional cleaning service at home and work domestic and commercial customers in the Dunfermline and West Fife area. 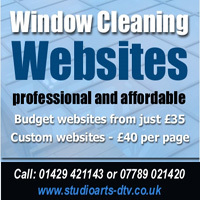 Using the latest window cleaning techniques, their service can provide window cleaning up to 40 feet off the gound without the use of ladders. With their WFP system excellent results can be acheved with minimum risk. The company is fully insured and folloe health and safety guidelines to ensure work is carried out to a high standard without compromising safety. To contact them for more information, or provide a quote, or where necessary, arrange an appointment to discuss your requirements in more detail, please call them on either of the numbers below. Clear Vision is located in Conon Bridge near Inverness and serves Inverness and all surrounding areas. Clear Vision provide a professional window cleaning service, both commercial and residential using the latest high reach water fed pole system to clean windows. They also provide additional exterior cleaning services including conservatory and conservatory roof cleaning, gutter, fascia and soffit cleaning, solar panel cleaning and drain cleaning using a high powered jet wash system.